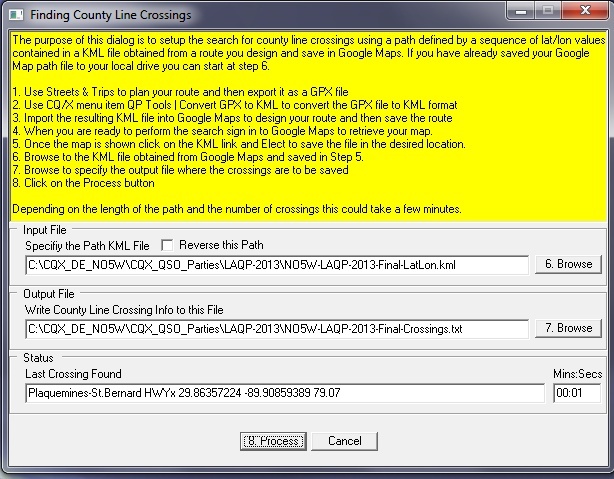 In this method, which was first developed and supported in CQ/X version 1.7.9.1 and is described in detail in the document Developing Crossing File Using Google Maps, the user performs the following steps with the objective of steps 1-4 being simply to obtain a file of latitude and longitude values describing the path taken by the route. Upload the KML file to Google Maps to create the route on that application. Submit the KML file of lat/lon values to CQ/X which refines the lat/lon values in order to analyze the route, determines the county line crossing points, and builds the necessary crossing file and other data. As a final check of the crossings it is a good idea to export them from CQ/X in a format (CSV) that Streets and Trips can import. Importing the crossings found by CQ/X into S&T and comparing them to the route defined in S&T will show whether the Google Map path deviated from the route defined in S&T. If that is the case then it will be necessary to tweak the Google Map route to bring it into agreement with the original route from S&T. Steps 4-5 would then need to be repeated. an Export as CSV Text feature for exporting the crossing results available for import into Streets and Trips in order to carry out the final check described in step 6. Some example results are shown below following the screen shots. Here are links to several demo routes which have been analyzed using the tool. These maps show the planned route, the counties involved, the entry/exit points for each county, and the driving distance across each county. Dayton 2013 Demo-- Demo multi-state route from New Orleans, LA to Dayton, OH used in presentation to the County Hunter Forum at Dayton 2013 Hamvention. NO5W FQP 2013 Saturday-- Saturday route for NO5W in the 2013 Florida QSO Party. Orlando to Seattle-- Demo multi-state route from Orlando, FL to Seattle, WA. This extreme example, which involves finding about 125 crossings, takes 3 minutes on a Sony Vaio 2.67 GHz machine with 6 GB RAM. CTDXCC 2012 Demo-- Demo multi-state route from New Orleans, LA to Austin, TX for CTDXCC 2012.